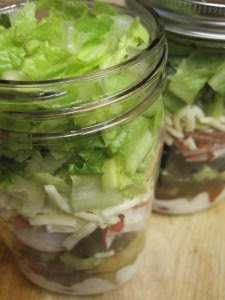 I know that I probably seem obsessed with Salad-in-a-Jar recipes, but they are so simple and good. 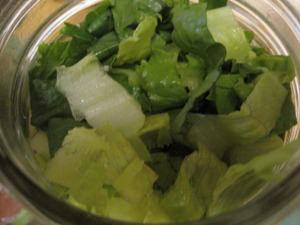 I even put together a salad in a jar that I poured into a serving bowl and served on Christmas Day. It made the meal simpler to put together and it allowed me to make the salad on Sunday for being served on Thursday. 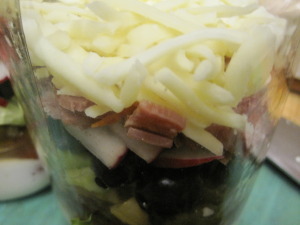 This salad was inspired from my adolescent memories of trips to the salad bar at our local pizza place. I loved the salad bar at the pizzeria because it contained many things that weren’t ordinarily included in our family salads. 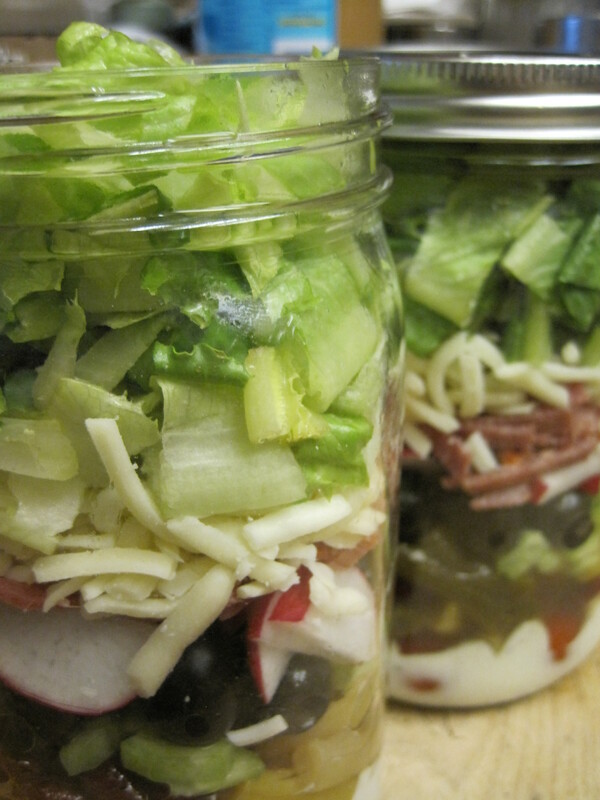 This Salad-in-a-Jar successfully captured those remembered flavors. All I needed was a slice of pizza on the side for me to be able to imagine that I was in the pizzeria again. I realize that everyone would select different things from the salad bar, so my choices may differ from what you would choose. That’s part of the amazing part of this whole salad in a jar trend. You can create whatever type of salad you want. Let’s discuss how I created this one. 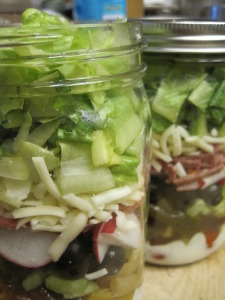 Once again, the dressing is layered into the jar, first. In this case, I used ranch dressing, but you may use whatever dressing is your favorite from the salad bar. Hearty ingredients that will hold up to being in contact with the dressing go next. 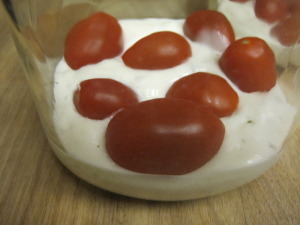 Here are some grape tomatoes added to the jar. The three bean salad is added next. It will hold up fine if it comes in contact with the dressing. 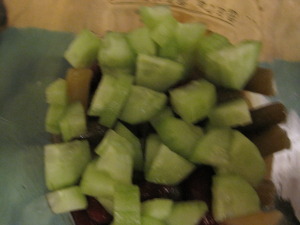 This is topped with chopped cucumber. 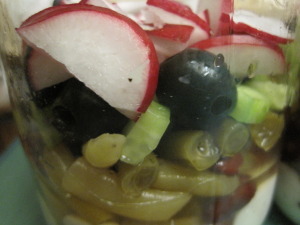 Black olives and sliced radishes are added next. 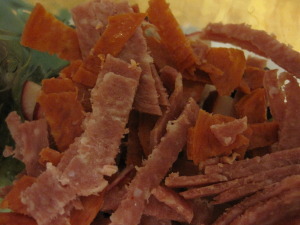 Then some sliced pepperoni and/or salami are layered in. This is topped with shredded cheese. Finally, the remaining space in the jar is filled with chopped or torn lettuce. Cap the jars and store them upright in the fridge for up to 4 days. 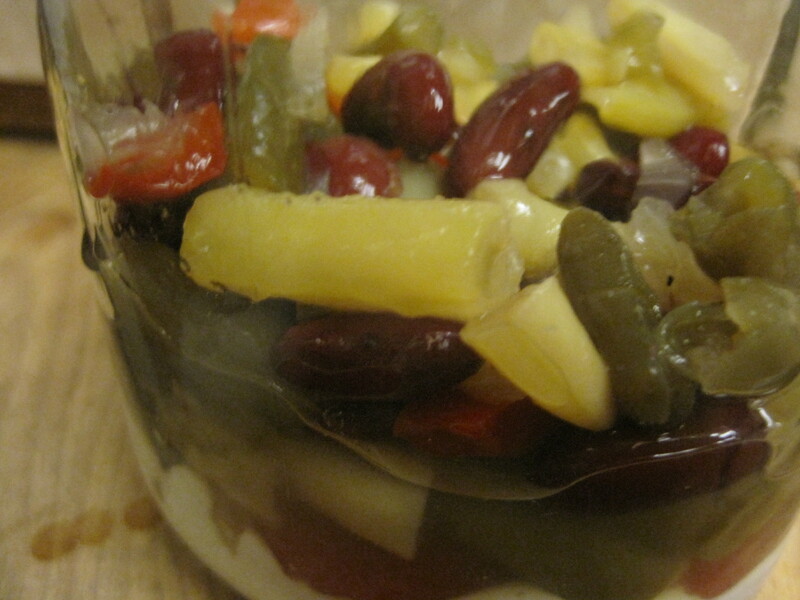 Before serving, invert jar so that dressing pours over ingredients and then pour onto a plate or into a bowl. If you don’t pack the ingredients too tightly, you can use a long fork and eat from the jar. I always tend to put too much stuff in my salads for it to work that way, though.